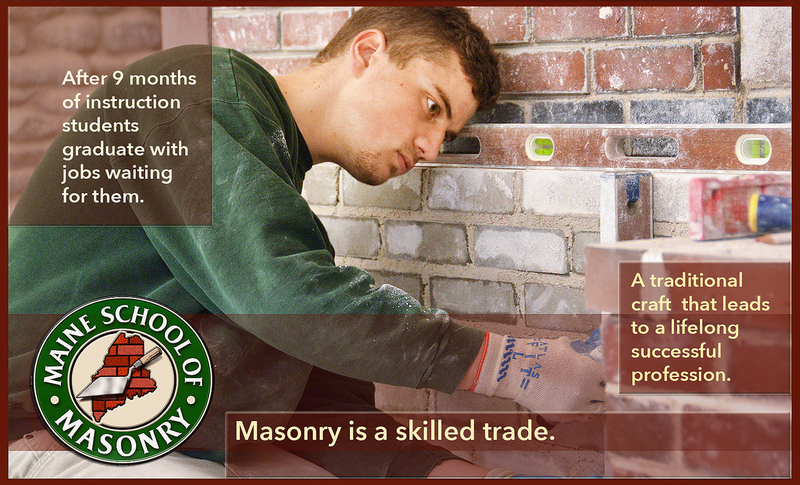 The mission of the Maine School of Masonry is to provide functional education and artistic appreciation of masonry to students who wish to achieve a personal or professional level of success in this traditional trade. Ancient pyramids, the Washington Mt., Maine’s State Capitol or any other stone or brick building that marvel visitors never could have been built without experienced masons. The level of complexity involved in masonry work varies from laying a simple wall to installing an ornate exterior, patios, brick ovens, garden walls, the perfect chimney, ornamental stonework or a high-rise building, and always will require the skill and precision of a mason. Being able to offer new generations a future in an age-old profession is a passion with the school’s founder Mitch. He still travels to schools throughout the state inspiring new generations in the craft. The country’s only private non-profit masonry school continues to be a dream come true for its founder, Stephen D. Mitchell, who opened its doors in 2005. Since then, Mitch has taught hundreds of students the fundamentals of laying brick and stone work empowering every one who graduates with the skills to start their own masonry business, or to obtain a professional job in the business — just after nine months of instruction. Mitch is a Masonry graduate of Northern Maine Vocational Technical Institute, ’73. After his two-year apprenticeship ended, Mitch started up his own successful masonry contracting business. Although he enjoyed his life he felt there was something more he needed to do, so in 1980 when he was offered a major position as a masonry instructor at a center for young men in the Midwest, he accepted. Mitch’s teaching skills blossomed as he discovered the missing link in his life, which soon became his passion. Since then he has taught masonry skills at private, public and secondary schools, all the while unknowingly preparing for his masterpiece — The Maine School of Masonry. For Mitch there is nothing like being able to teach new generations the hands on skills of masonry at the Maine Masonry School. He’s always visibly thrilled when a student makes a discovery progressing their craft under his careful watch. He still loves going out with his bag of tools to inspire students at local high schools, every hopeful that one of them will wish to pursue a masonry trade. Will, a graduate of the Maine School of Masonry, fell in love with the precision, engineering, execution and art of the trade from the beginning. Any student of his knows, while building a wall, to keep the space between bricks at a bare minimum. He’s a perfectionist, which is a major attribute in building structures that will last for lifetimes. He inspires his student’s everyday to achieve more than they could ever imagine. After receiving his B.A. at the University of Maine, in Orono in engineering he began teaching at the school. Ellis is also an inventor and is pursuing a Graduate Degree at the University of Maine. In the photo, Will stands next to his well-crafted fireplace he constructed when he was a student at the school. Dori keeps the school afloat with her administration skills, infusive energy, friendly smiles and brilliant conversation. She has a passion for the school that’s infectious and she loves the art of bricklaying. Organizing is her forte and she invites any and all enquires.